Published in Advanced Functional Materials as a Feature Article! Possessing a strong piezoresistivity, nanocomposites of metal nanowires and elastomer have been studied extensively for its use in highly flexible, stretchable, and sensitive sensors. In this work, we analyze the working mechanism and performance of a nanocomposite based stretchable strain sensor by calculating the conductivity of the nanowire percolation network as a function of strain. We reveal that the nonlinear piezoresistivity is attributed to the topological change of percolation network, which leads to a bottleneck in the electric path. 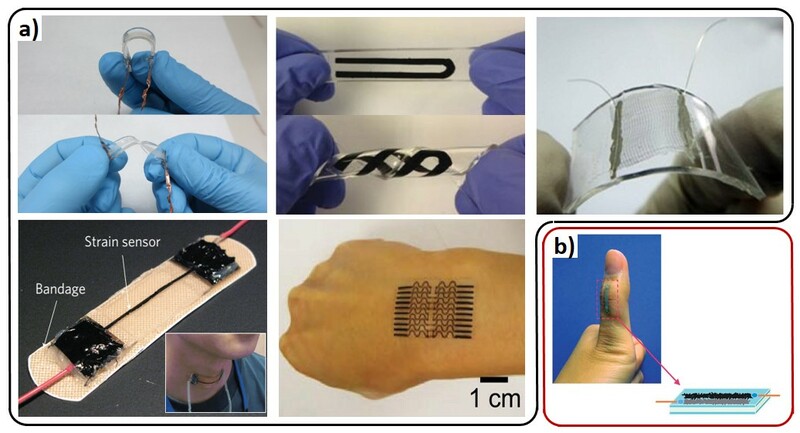 studies of bending in structures relevant to inorganic flexible electronics. I attach slides for an ASME talk, which is based on a recent paper. A 1um-thick Cu film was deposited on Kapton 50HN substrate, with a thin Cr interlayer to improve adhesion. The specimen was in-situ annealed at 200oC for 30min after deposition. This FIB image was taken after the specimen was uniaxially stretched to 50% and released. This is a winning entry in the Sci/Terp Video Competition at University of Maryland (UMD). Hi, I'm a Physics grad student working with Dr. Ellen Williams. My job is basically making nanoelectronic devices, measuring their characteristics and trying to understand the underlying "Physics". What I want to gain from this course is to come to know how flexible macroelectronics are approached and researched. An increasing trend of "thin" applications poses new challenges in terms of low power usage and durability. I am Yong Wang, currently a PhD student in the Mechanical Engineering department at the University of Maryland. I got my Bachelor degree from the University of Science and Technology of China and Master degree from the Hong Kong University of Science and Technology. I am enrolled in Dr. Teng Li's class on flexible macroelectronics in this semester. My name is Kurt Vargas. I am an international student from Costa Rica, currently attending the University of Maryland at College Park. I am a Christian who loves the Lord and serves Him full time. I also love reading my Bible!